We have made enormous strides in fighting tooth decay, but unfortunately teeth are still prone to natural wear, trauma and breakage. At our Bradford, ON office, comfortable, natural-looking tooth restorations are possible thanks to some of the most advanced dental technology available. Dental implants offer patients long-lasting solutions to missing teeth, and provide a strength and durability not found in traditional dentures. 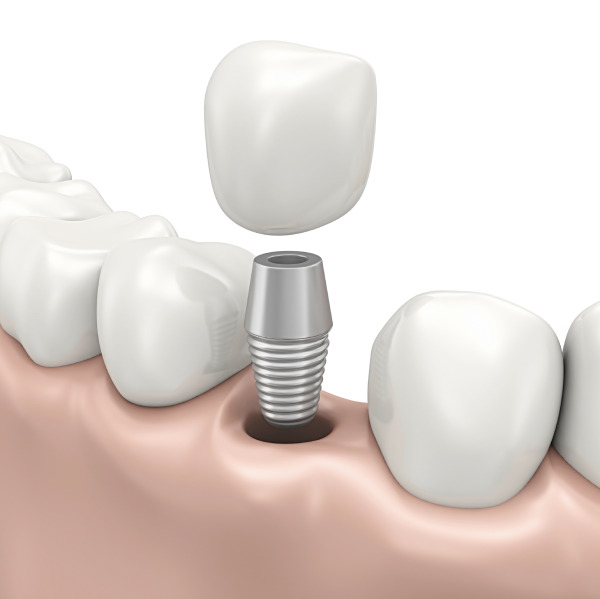 Dental implants function as a prosthetic root, holding the new tooth – or teeth – in place. Made of titanium posts, implant placement is minimally invasive and patients are usually able to return to their usual daily activities in no time! Dental implants don’t require any complex or lengthy procedures, however implant surgery and restorations are usually performed in stages. First, the damaged tooth is removed and the jawbone is prepared for surgery. This may involve bone or tissue grafting, which Dr. Chan also performs in-house. Once the jawbone has healed, the dental implant posts are surgically placed into the jawbone. A healing period follows, during which time the titanium posts fuse with the bone in a process known as osseointegration. This fusion creates the stability so lacking in other forms of tooth replacement. The healing period may take a few months. At a later date, Dr. Chan will place an abutment on the implant post, onto which the new restoration is placed. Dental implants offer patients the ability to smile, bite, chew and speak naturally and without pain. With daily care and regular professional cleanings, implants can provide a lifetime of oral health and dental function. For our patients’ convenience, Dr. Chan places dental implants, and restores them at our Bradford practice. We are fully equipped to perform the procedure from placement to restoration. Dr. Chan uses Nobel Biocare implant systems – these systems provide the doctor the flexibility to customize the implant treatment according to a patient’s specific needs. The system enables the doctor to treat patients with varying tissue and bone levels. Dr. Chan is also able to provide our Bradford patients with implants to support single crowns, dentures, or even a full-arch replacement. Of course, all patients are assessed individually and each case varies. Dr. Chan and his team of professionals are always happy to discuss specific details during the assessment process. A treatment plan will be established with our patient in order to meets their exact needs and expectations. Contact Arbo Dental Care Today! Our established practice is dedicated to the needs of our Bradford community. We care deeply for our patients and their overall wellbeing. For more details on dental implants, or any restoration procedure, please contact us today. We look forward to providing you with your best possible smile!